You have a customer for life now! If you will mail me 30 business cards, I will pass them out for you... I wish I had thought about that before you mailed the package. 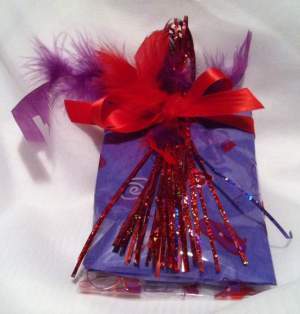 So glad I came upon your "site"... My order of Red Hat jewelry arrived in a timely way: ready for the Red Hat Society party I will attend, and I just have to tell you how nice everything was packaged!! I will do more shopping with you, and I certainly will pass out your business cards! Thank you, and Happy Holidays!! ... Yes, you may quote me..... Again: Everything was perfect! I was thrilled!! Free Gift Wrapping with any item! Select from Red Hat, all-occasion, or Christmas. 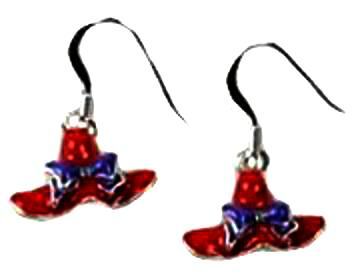 Genuine Swarovski crystal dangle earrings in a beautiful Red Hat design. Click photo for enlarged view. Link bracelet with toggle-clasp features a Swarovski pendant. Sorry, goldtone is no longer available. 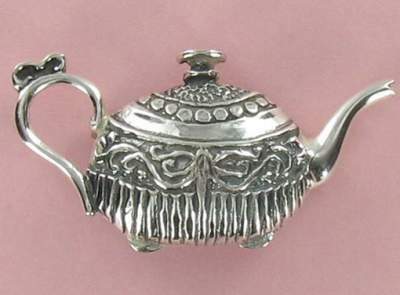 Silver-plated finish only. I just received my Red Hat watch and thank you so much. It's so cute. It is prettier "in person", and I know it will make a hit with the other gals in my chapter. We are always looking for fun, innovative items, and this watch is definitely that. ... Five of us started our chapter here in our retirement park in 2002, and it took off like wildfire! We had to beat them away with a stick! We have 40 gals, and that is more than enough. 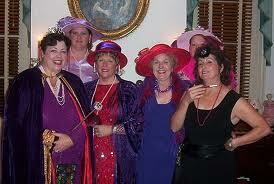 We are much more subdued that other chapters, but there's a few of us who are ready to be more flamboyant. We have already had wolf whistles sent our way as we strolled downtown Cocoa Village, but I'm sure if those young guys had slowed down long enough to see us up close and personal, they probably would have run for the hills !! Maybe they thought we were ladies of the night out for a daytime stroll.!! hahaha. Again,thanks for the quick mailing of my watch. I will enjoy it very much. 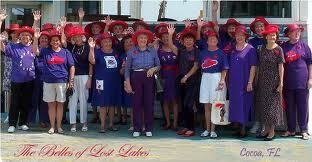 PS....the enclosed picture is of our Belles of Lost Lakes group at Cocoa Beach Pier.....I am the one on the right side with the white shorts. Matches RH213. Silver-plated finish only. Substantial 8" link chain. 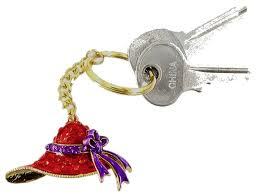 Red Hat Charm is 1 1/8" by 1/2", not including rings. Silver-plated finish only. 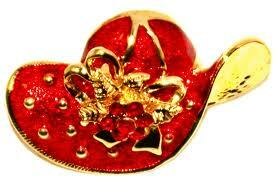 Shiny red enamel with gold trim make a stunner of a Red Hat pin with purple bow. Click photo for enlarged view. 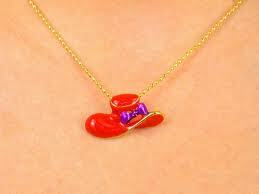 Beautiful enamel Red Hat slider pendant on a delicate 17" gold-plated chain with 2-inch extender. Click photo for enlarged view. Earrings match RH105. Gold wires only. Actual size: 1 1/8" by 1/2" (not including rings and wires). Click photo for enlarged view. 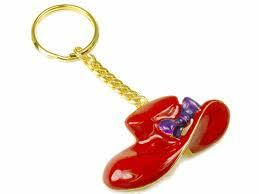 Shiny red enamel Red Hat key chain. Click photo for enlarged view. 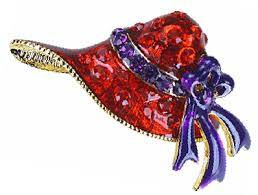 Silver-plated red hats and purple heels charm bracelet. Sturdy stretch band. Coordinates with RH107 and RH509. Click photo for enlarged view. 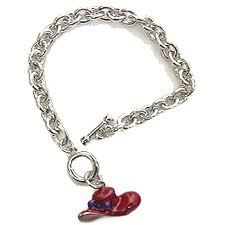 Silver-plated red hats and purple heels charm bracelet. Sturdy stretch band. Click photo for enlarged view. 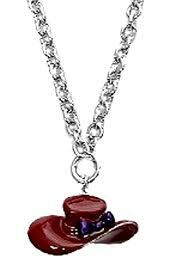 A very popular design that will coordinate with almost all your other Red Hat jewelry and apparel. Click photo for enlarged view. 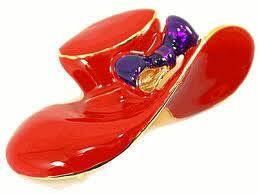 Shiny enamel Red Hat pin/pendant with purple and white polka dots. Just under 2" wide by 1" high. See RH509 for matching dangle earrings. 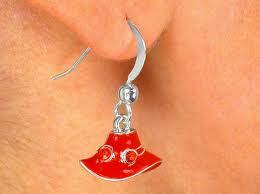 Enamel red hat earrings match RH107, RH204, and RH209. Click photo for enlarged view. Swarovski crystals and purple enamel bow combine to create a stunning Red Hat pin, perfect for the lapel of a purple suit. Click photo for enlarged view. Matches RH104 pin. Click photo for enlarged view. 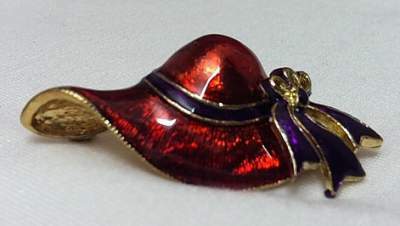 Beautiful translucent enamel over gold makes this red hat with purple hatband a real stunner. 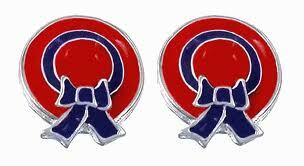 Can be worn as a pin or on a gold chain (not included). Actual size: 2" wide x 1" tall. Click photo for enlarged view. Swarovski crystals spell it out in style. 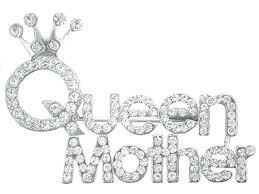 Silver-plated pin is a must for all Red Hat Society Queen Mothers! Complimentary giftwrapping available if this is a gift. No more droopy earrings! These heavy-duty clutch backs will hold your heaviest pierced earrings securely in place without drooping. Avoid the risk of losing an earring because a small clutch can't do the job. Just compare with the normal-sized clutch in the middle. No comparison! Festive red hat with fancy bow. trimmed in gold! Pin measures 1 3/8" wide by 5/8" high. Click photo for enlarged view. 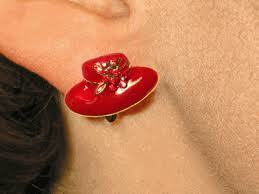 Red hat enamel earrings match RH208. All red with two Swarovski crystals. Click photo for enlarged view. Genuine Swarovski crystal accent beautiful enamel earrings. Click photo for enlarged view. 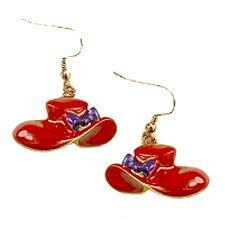 Shiny red enamel hat earrings with purple bows. 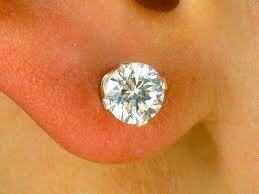 Pierced only. 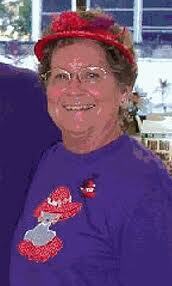 Red Hat Society members under 50 wear pink hats and lavender clothes. 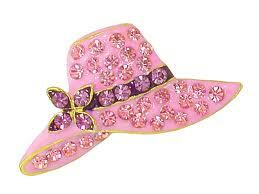 What could be more perfect than this beautiful pink pin with genuine Swarovski crystals? Click photo for enlarged view. The perfect earrings for your lavender suit! 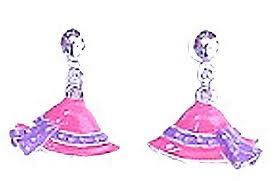 Pink hat earrings with swarovski crystals. Shiny pink enamel pin/pendant with lavender hatband and silver polka-dots. Just under 2" wide by 1" high. See RH515 for matching dangle earrings. 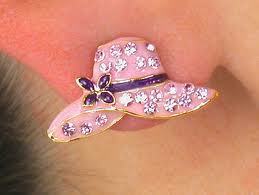 Enamel pink hat earrings match RH114. Click photo for enlarged view. It's tea time! 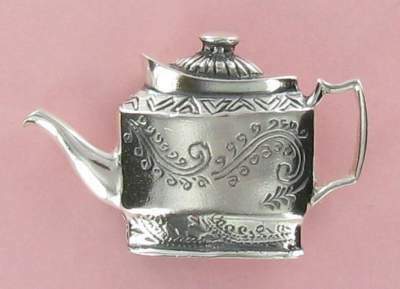 Tea pot pin is made of solid .925 sterling silver. It measures 15/16" high by 1 7/8" wide. Cute alone, but even cuter in a group of three or four. 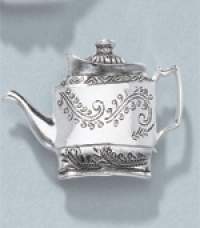 Any time is tea time when you are wearing this beautiful tea pot pin of solid .925 sterling silver. It measures 1" high by 1 3/4" wide. Wear it alone or in a group. 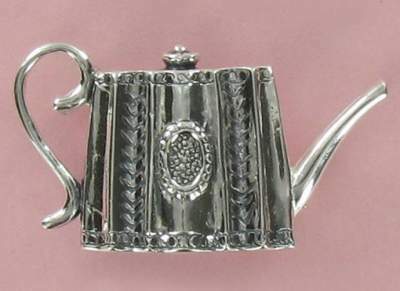 Lovely tea pot pin of solid .925 sterling silver. It measures 1 1/8" high by 1 3/4" wide. Over 2 carats total weight! Lots of flash and fire. Solid .925 sterling silver. Makes a great present without breaking the bank.